I have hearing loss in my right ear. If I turn up the volume to hear in my right ear, the left ear is dangerously loud. Apple has offered a left/right audio balance for several iOS releases, but it doesn’t make it obvious where to find it. It’s not in Sounds, but in Accessibility (Settings > General > Accessibility). Swipe down to the Hearing section, and you’ll find a number of options. All iOS devices can adjust left/right balance. iOS hides its very useful left/right audio balance control in Accessibility settings. 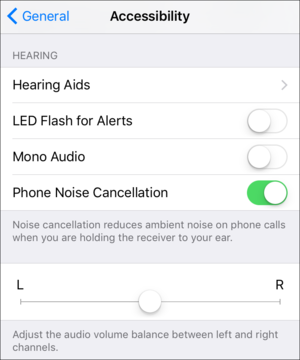 But you’ll also see settings for working with Bluetooth-connected and other hearing aids, for mono audio, and to remove phone noise cancellation, which can affect the quality of calls negatively in some cases. Accessibility is a misnomer, because the section is full of useful customization and controls that are useful for everyone, not just people with a specific lacuna, like a visual or hearing impairment. As a general tip, if you’re looking for whether a setting exists, Settings has a slightly hidden search feature. Swipe down slightly from the top, and you can tap in any potential keyword. Enter “bal” and the nested balance setting appears as a match. Tap, and you leap right to it.